Sparkle PS towels bring premium quality and absorbency with Thirst Pockets and the convenient Pick-a-Size. Allowing each two-ply sheet to absorb six times its weight, Thirst Pockets are designed to draw in liquids and wipe dry fast so you can clean any surface with confidence and speed. Pick-a-Size sheets with strategically placed perforations allow you to choose the sheet size you need to get the job done. 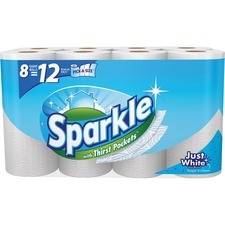 Two-ply paper towels with eight giant rolls equal 12 Sparkle regular-size rolls. 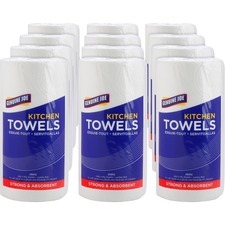 Each perforated roll of towels fits standard kitchen-roll dispensers. 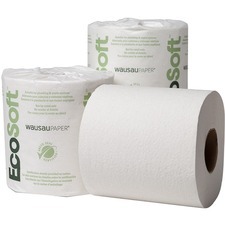 EcoSoft Bathroom Tissue - 2 Ply - 4.38" x 3.75" - 500 Sheets/Roll - White - Embossed, Absorbent - 96 Roll This embossed EcoSoft® universal tissue is designed for those seeking to achieve green status for their facility and purchase tissue produced with methods less harmful to the environment. It is 100% recycled and contains a minimum of 25% post-consumer wastepaper content to exceed EPA guidelines. This double-ply tissue is ideal for commercial properties, hotel guest rooms and government facilities that have mandates to be green. OptiServ Hybrid White Translucent Roll Towel Dispenser - Roll Dispenser - 16.8" Height x 12.1" Width x 9.8" Depth - White - Touch-free, Reversible Cover, Stub Roll, Translucent, Locking Cover Unique and elegant, the OptiServ Hybrid® offers the benefits of electronic touch-free dispensing as well as the convenience of mechanical dispensing when desired. In either mode the OptiServ Hybrid® delivers a single pre-measured towel that discourages users to take only what is needed to reduce waste, making it ideal for office buildings, colleges and universities and high-traffic washrooms. RMC Rest Assured Domestic - Half-fold - 250 - 10 Pack Rest Assured® toilet seat covers are made from a quick dissolving tissue, are biodegradable and flushable. They are septic system safe and won't harm plumbing under normal use. Available in a number of options - half fold/quarter fold/roll/lever dispensed. Economical one-ply bath tissue meets the day-to-day needs of customers who require EPA compliant for recycled fiber content product. It is excellent solution for education, government, tax-supported and other facilities that are sensitive to environmental concerns. It also meets Green Seal Standard GS-1 based on chlorine-free processing, energy and water efficiency. 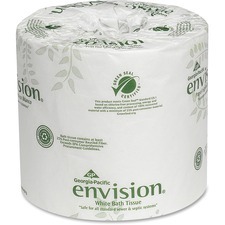 Envision tissue still provides look of quality your employees, guests or tenants will appreciate. Perfect Size Case allows easier handling and storage. 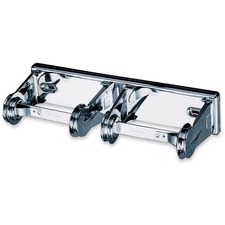 Locking bath tissue dispenser holds two standard-size tissue rolls with a minimum core diameter of 1-1/2" (38mm). Concealed tension springs prevent free rolling of tissue. 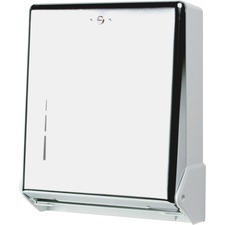 Dispenser locks to prevent theft of tissue roll and features a chrome finish. 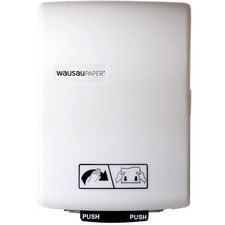 Large-capacity towel dispenser is an economical solution for high-capacity dispensing of all C-fold or multifold towels. Clean, low-profile design is perfect for tight spaces. The Present system offers a smooth, one-at-a-time towel presentation to enhance efficiency and image. Large-capacity dispenser holds 450 C-fold towels or 750 multifold towels (each sold separately) to reduce maintenance costs. 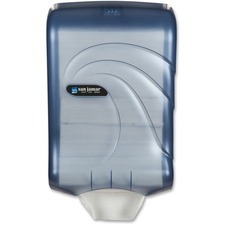 True Fold Towel Dispenser accommodates both C-fold and multi-fold paper towels. 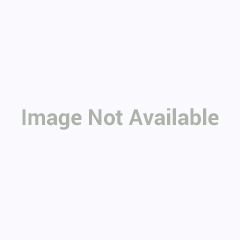 It is easy to use and maintain with a convenient, operator-friendly flip door that helps eliminate product waste. This large-capacity dispenser holds up to 300 C-fold towels or 500 multifold towels to reduce maintenance and labor costs. Standard keylock prevents towel theft. Touchless dispensing - with no lever to pull or wheel to turn - offers a great option for sanitary hand hygiene. All users have to do is pull on the protruding towel. Dispenser features a metal front with an attractive chrome finish and a break-resistant plastic back panel that is sure to stand tough against years of heavy use.